One take light painting, pretty much SOOC – just a slight GND effect added to the sky in LR3 and obviously a conversion to B&W. The original colour version is in the comments. The colour isn’t at all bad, though I though the grass was a little uninspiring. The black and white felt better suited to the subject matter too. Just upfront I’d add a note to the effect that in so far as this is a memorial to the victims of conflict, the crosses for the graves are simply there as the image that was in my mind and a shape that would easily repeat into the distance. It’s not meant to be religious at all, just a quickly understood icon for a western audience, I suppose. 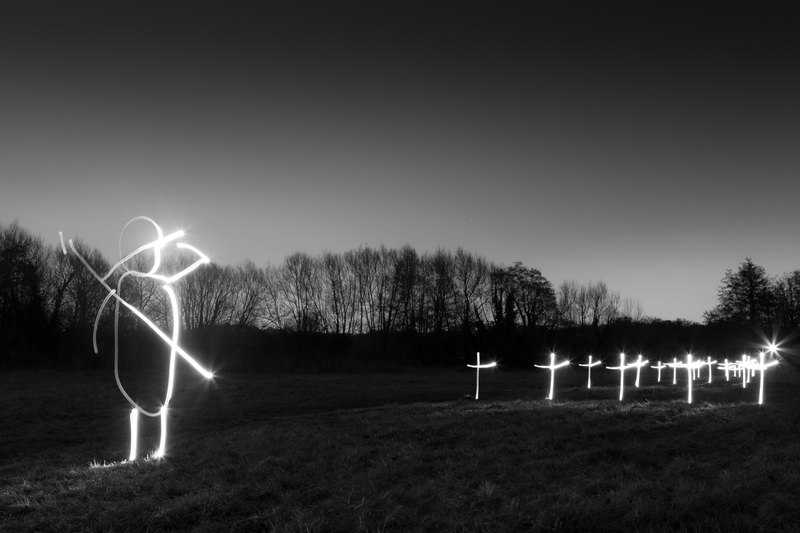 On the technical side it’s a 414 second exposure – enough time to make all 24 crosses, the saluting soldier and the distant flare. As regards the flare, I’m glad it worked – just a result of aiming the torch (aka flashlight) at the lens from 200m distance. I felt the image needed an anchor at the end of the field of crosses, and the effect worked quite well I feel. Meanwhile, I wanted to give the impression of angled light from that point through the crosses to the soldier, so attempted to tilt the torch’s face on the left side of his body to give the impression of shadow there. This gave a few bends to lines that might have better been straight (e.g. his helmet’s left rim), but was, by and large successful, so it’s a technique I’ll try again. As for the torch itself, this is a new one. I mentioned in www.flickr.com/photos/flatworldsedge/5233410987/ I felt my cheap £1 torch was better than an expensive on due to lack of flare. It simply isn’t bright enough over 10-15′ though. So I invested in a ridiculously powerful torch with a much tighter beam. You can see above there’s quite a bit of flare, but it produces better lines I think. It’s also an aluminum finish, so you can trace it across your limbs without it catching – the rubber grip torch is too sticky to trace properly against the body. Not sure if that’s interesting, but I get quite a few questions about this sort of thing at the moment, so thought I’d note it here. I’ve also put a trial run from another location in the comments – probably a stronger scene, but it needed the soldier figure to tie it together, I think, and that only occured to me later.